The 1000 Series CNC Plasma Bridge and Rail is designed for the customer that desires modularity, versatility and a wide range of working envelopes. 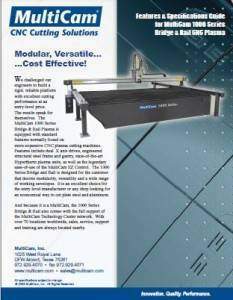 It is an excellent choice for the entry level manufacturer or any shop looking for an economical way to cut plate steel and aluminum. 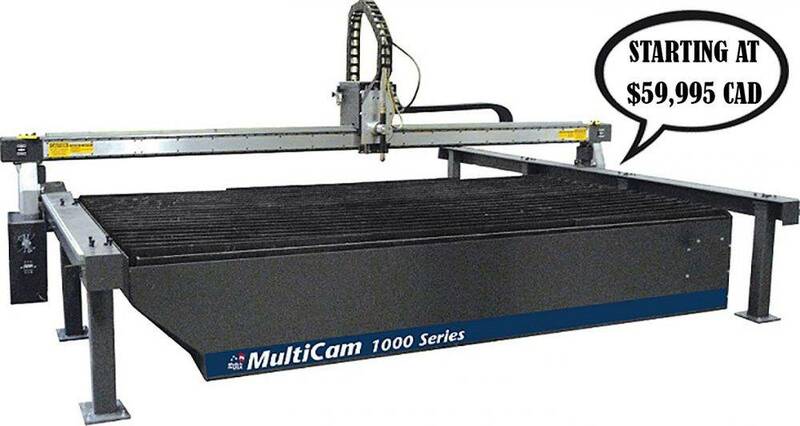 The MultiCam 1000 Series Bridge & Rail Plasma is equipped with standard features normally found on more expensive CNC plasma cutting machines. Features include dual X axis drives, engineered structural steel frame and gantry, state-of-the-art Hypertherm plasma units, as well as the legendary ease-of-use of the MultiCam EZ Control. Custom engineered all steel frame and gantry design for high strength and rigidity. Normally when you change material type, material thickness, or arc current, many parameters such as feedrate, pierce delay, pierce height, etc. all need to be adjusted. MultiCam has made this process simple by integrating all of these cutting values into an easy-to-use menu driven database on our hand held controller. The user simply selects material type, thickness, and arc current and all of the settings are adjusted automatically.